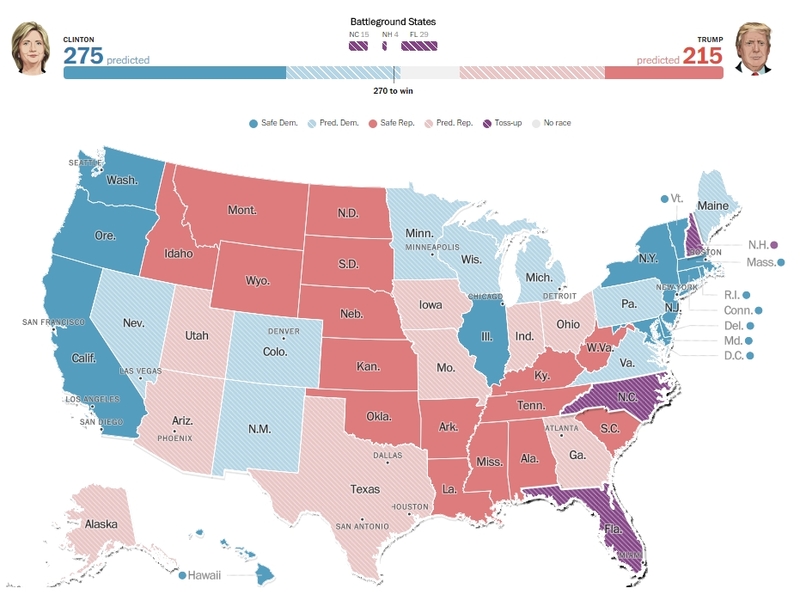 Here are the other six maps from 270towin.com. You can see all twelve maps together at their site. But we decided to separate them, and see what each of the map authors had to say. The first is from the Rothenberg and Gonzales Ratings. In this tightening race, Trump’s Electoral College map is still daunting: Even if he runs the table in Florida, North Carolina, and Ohio, he’s still short of 270 electoral votes. 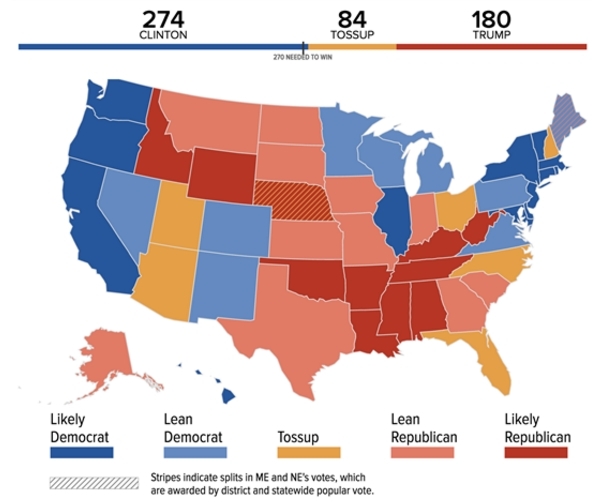 Indeed, give Trump ALL of the 84 electoral votes in our Tossup column, and he falls short of 270 (it gets him to 264). So his best — and maybe only — path is picking up one of Michigan (where Clinton has led in every public poll since August), Pennsylvania (where another recent poll had her up double digits), or Wisconsin. It’s why Trump was campaigning yesterday in Wisconsin, and also why Clinton is now spending ad dollars in Wisconsin and Michigan. And guess what: The Marquette Law poll, the gold standard of Wisconsin polling, comes out with a poll this afternoon. Next is the NBC map. It seems that 274 is the “magic number” for several of these maps. It shows just how close this election has become. In this tightening race, Trump’s Electoral College map is still daunting: Even if he runs the table in Florida, North Carolina, and Ohio, he’s still short of 270 electoral votes. 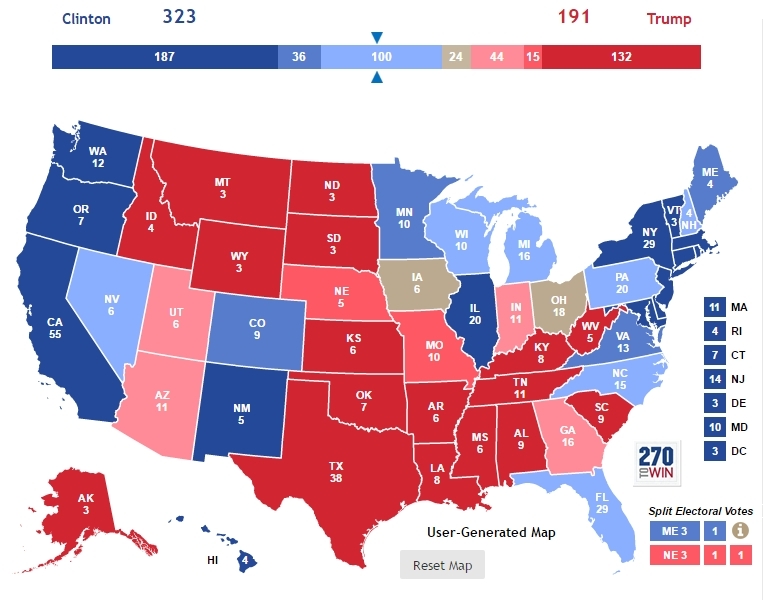 Indeed, give Trump ALL of the 84 electoral votes in our Tossup column, and he falls short of 270 (it gets him to 264). So his best — and maybe only — path is picking up one of Michigan (where Clinton has led in every public poll since August), Pennsylvania (where another recent poll had her up double digits), or Wisconsin. It’s why Trump was campaigning yesterday in Wisconsin, and also why Clinton is now spending ad dollars in Wisconsin and Michigan. NPR is a radio network (“National Public Radio”), but they have an online presence, which allows them to do graphics. 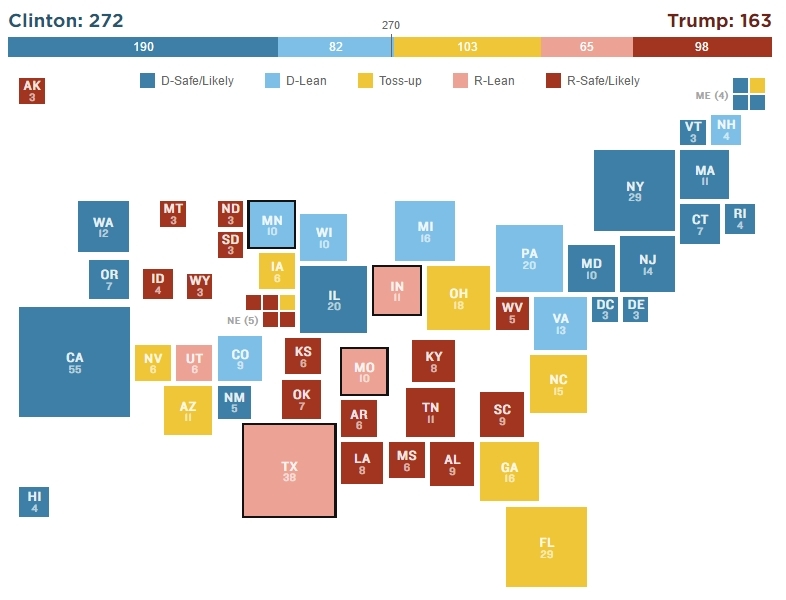 As you can see, they use boxes to illustrate the states, and how much impact each has in the Electoral College. Will Clinton win Texas? Probably not. But it is looking like it could be within 10 points for the first time in 20 years. And that’s when an incumbent president Southerner from neighboring Arkansas was on the ballot. We also did move a state more in Trump’s direction — Minnesota from Safe/Likely D to Lean D. Minnesota has been within 6 points in decent polls, and Obama won it by only 7. Will Trump win Minnesota? Like Texas for Democrats, probably not. But the margin is worth keeping an eye on. The last week has been a tough one for Hillary Clinton. Last Friday’s announcement by FBI Director James Comey that emails considered “pertinent” to the investigation into Clinton’s use of a private email server had been discovered accelerated a bump in Donald Trump’s poll numbers that had begun before that news hit. National polling was the first to tighten — the WaPo-ABC Tracking Poll showed the Democratic presidential candidate up three points on Friday — but swing-state polling has followed suit. CNN, as of Friday morning, even had Clinton below 270 electoral votes for the first time in a long time. . . The biggest move is Ohio — from “toss-up” to “lean Republican.” The Buckeye State, which went for Barack Obama in each of his two races, has long been one of the friendlier swing states for Trump, thanks in large part to its older and whiter (as compared with the country as a whole) population. The last two polls in the state have shown Trumpup five points, and the RealClearPolitics polling average gives the Republican nominee a 3.3-point edge. That fits more with our “lean” category than our “toss-up” one. Clinton isn’t giving up on the state, however — she’ll be in Cleveland on Sunday. Governing gives Hillary just 272 Electors. Since we last handicapped the Electoral College on Oct. 5, the candidates’ fortunes have reversed. Currently, we project that Clinton has 272 electoral votes leaning her way, while Trump has 187. That’s an increase of nine electoral votes for Clinton, and a decrease of 29 for Trump. 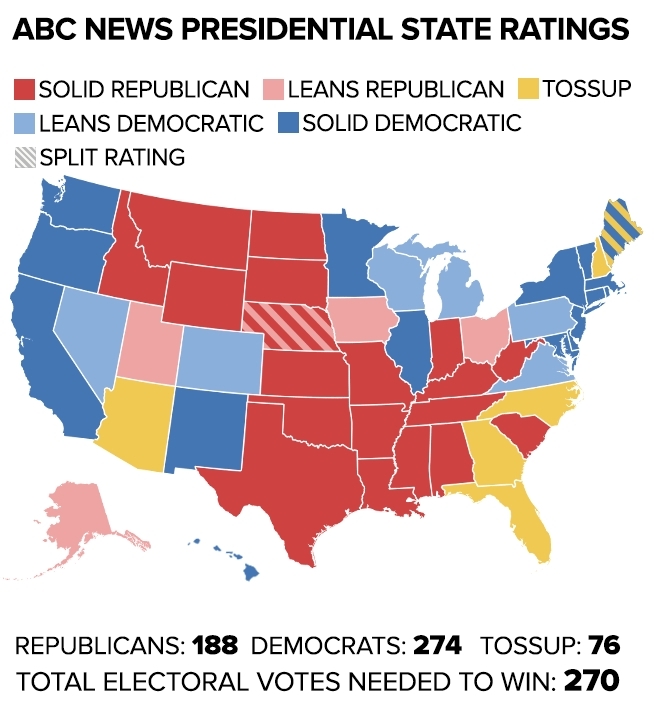 Another 79 electoral votes are currently in the tossup category. And finally, we have ABC News. Their map gives Hillary 274 Electors, even without Florida, Ohio, North Carolina, and New Hampshire. 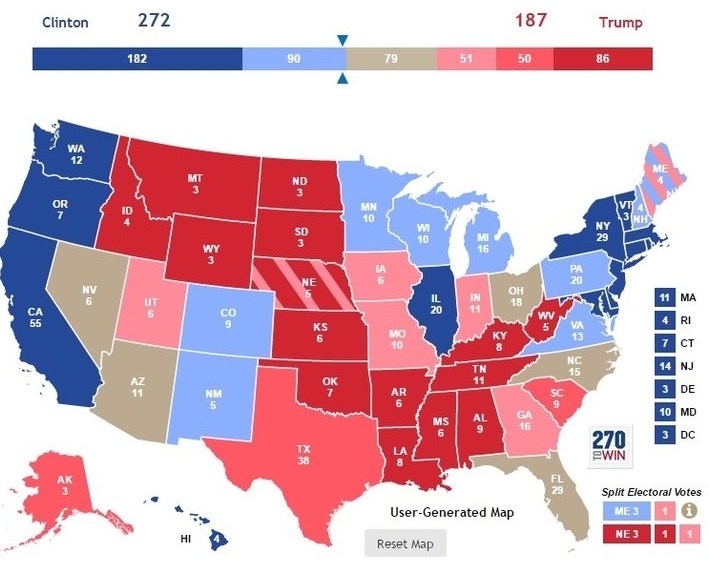 Democratic presidential nominee Hillary Clinton is maintaining a decided advantage in the Electoral College this November, strengthening her grip around states tipping her way while forcing Republican nominee Donald Trump to defend a handful of typical GOP strongholds.